Maximianus, AD 286 to 310. AE follis. Denomination : Bronze follis. Mint : Lugdunum, 2nd (PLG B). Date : issue of AD 302 to 304. Size : 25.8 X 26.8 mm. Weight : 10.20 grams. Grade : XF with a brown and green patina, with just hints of an underlaying silvering. Obverse : Head of Maximianus left, with IMP MAXIMIANVS AVG around. 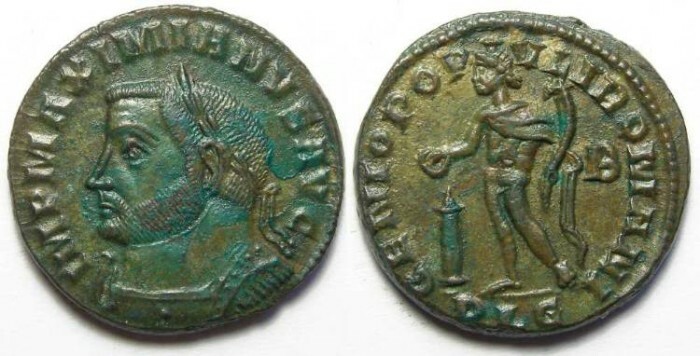 Reverse : Genius standing left, wearing a modius on his head, holding a cornucopiae and patera over a lited altar, with a chlamys over his shoulder, with GENIO POPVLI ROMANI around, with the mint mark PLG below with the officina mark B in the right field (Lugdunum 2nd officina).